A passionate healthy eating chef! Good food and balanced nutrition have always been an integral part of Charlotte’s life. Growing up in a family centred around home cooked, healthy and nutritious eating it’s no wonder she is where she is now. Taught to cook by her father, Charlotte owes her enthusiasm and passion for cooking, eating and everything in between to his wisdom and love. Charlotte has immersed herself into the pot of healthy, nutritious and most importantly tasty cooking. 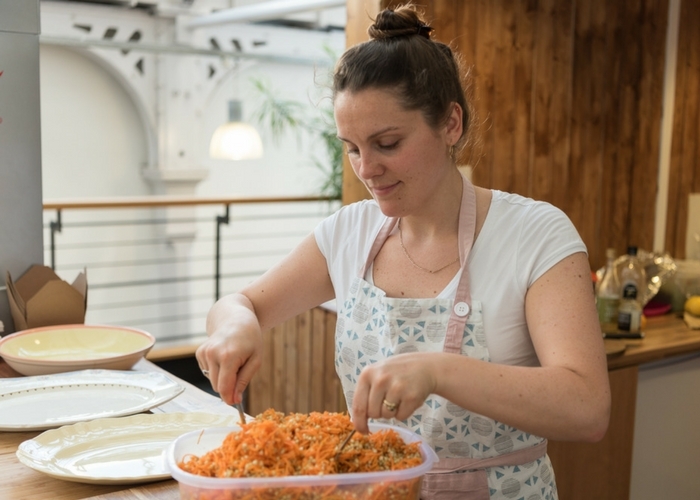 Charlotte ran a small but lively cafe in Tooting Market, South London where herself and two friends locally sourced curated recipes and hand cooked every aspect of the food served. Alongside the cafe, Charlotte ran a series of culturally themed pop-up restaurant nights incorporating live music, dance and of course, a beautifully prepared cuisine to match. Charlotte has continued to create healthy cooking environments and is now managing a festival food stall serving hand cooked bubble and squeak with all the trimmings! Currently living in Brighton, soaking up the sea air and vibrant buzz, Charlotte believes our bodies need colourful, unadulterated and balanced foods full of energy to help us fully reach our optimum health. And hey… it’s easier than you think! Vegetarian and vegan cooking opens a wealth of creative possibilities, bold flavours and experimenting with unique combinations mean we can love the food we eat, and our bodies will love us back!